As a research partner to United States of Care, Penn LDI produces, distills, and disseminates research evidence on what we know, and don’t know, about expanding health coverage. 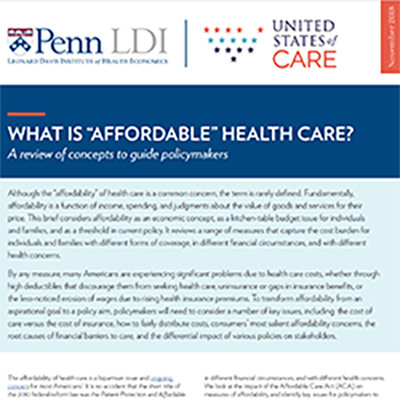 Penn LDI brings its expertise to bear on important questions of affordability, value, quality, and health care markets, and identifies and addresses emerging knowledge gaps regarding the implications of health care coverage policies. This partnership is part of Penn LDI's broader work on insurance reform. 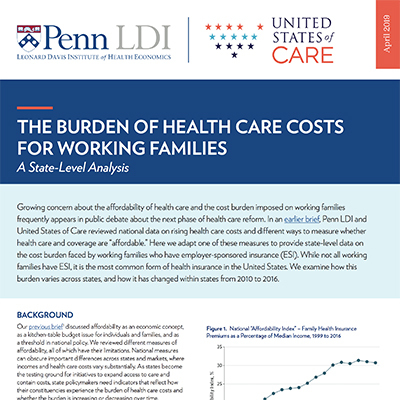 Penn LDI Senior Fellows investigate narrow provider networks; the impact of the ACA on health care coverage, costs, and the labor market; individual market dynamics; and the health insurance exchanges. In this second brief of our affordability series, we adapt a national-level affordability index to provide state-level data on the cost burden faced by working families who have employer-sponsored insurance (ESI). We examine how this burden varies across states, and how it has changed within states from 2010 to 2016. Read our full brief, summary, or Health Affairs blog post. In December 2018, Penn LDI joined United States of Care for their inaugural convening of policymakers, advocates, influencers, and researchers from across the country to discuss the future of American health care. 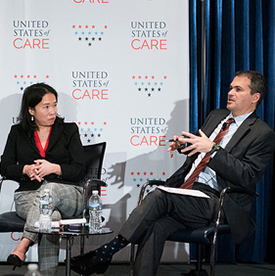 LDI Director of Policy Dave Grande moderated a panel on the building blocks of change featuring advocate Elena Hung and United States of Care Policy Fellows Jason Helgerson and John McCarthy. Read the recap. Issue brief: What Is "Affordable" Health Care? The first in a series on the concept of "affordability," this brief considers it as an economic concept, as a kitchen-table budget issue for individuals and families, and as a threshold in current policy. It reviews measures that capture the cost burden for individuals and families with different forms of coverage, in different financial circumstances, and with different health concerns. You can also read our accompanying blog post. This report, a review of prominent state efforts to close the coverage gap, looks at the most ambitious proposals in Massachusetts, Vermont, Colorado, California, and Nevada, and identifies common challenges and themes that emerge. It serves as a case study in how different states build, or fail to build, the popular and political will towards health care coverage for all residents. States That Have Aimed to Close the Coverage Gap – What Can We Learn? In a Health Affairs blog post, Andy Slavitt, United States of Care Board Chair and former Acting Administrator of the Centers for Medicare and Medicaid Services, and Dan Polsky, Penn LDI Executive Director, comment on the most important lessons learned from our state-by-state analysis and provide a glimpse of future work. Since 1967, Penn LDI has been the leading university institute dedicated to data-driven, policy-focused research that improves our nation’s health and health care. Penn LDI works on issues concerning health care reform, health care delivery, healthy behaviors, and vulnerable populations. Penn LDI connects all of Penn’s schools and the Children’s Hospital of Philadelphia through its more than 280 Senior Fellows. Launched in February 2018, United States of Care is a non-partisan non-profit organization mobilizing stakeholders to achieve long-lasting solutions that make health care better for all. United States of Care aims to ensure every American has access to an affordable regular source of health care; protection from financial devastation due to illness or injury; and to accomplish this in an economically and politically sustainable fashion. We welcome a diversity of perspectives in this discussion. If you are interested in being involved in these efforts, please contact Meggie McCarthy-Alfano.